I enjoy Foundation Paper Piecing and have over the years made several projects using this technique, including the Spot On Quilt way back in 2006, and more recently the Geese Around the World Doll Quilt. Paper Piecing involves the use of a foundation upon which fabric pieces are sewn in a particular order; it is a great technique for accurate seams and sharp points. I do find Foundation Paper Piecing confusing, and each time I attempt this technique it seems that I need to re-learn the basic steps. Once I have re-acquainted myself with these steps it again becomes quite procedural and structured. It does not come without the occasional error : Oops no seam allowances! - Unfortunately doing is still the best way to learn (as does reading the instructions before trimming the units). 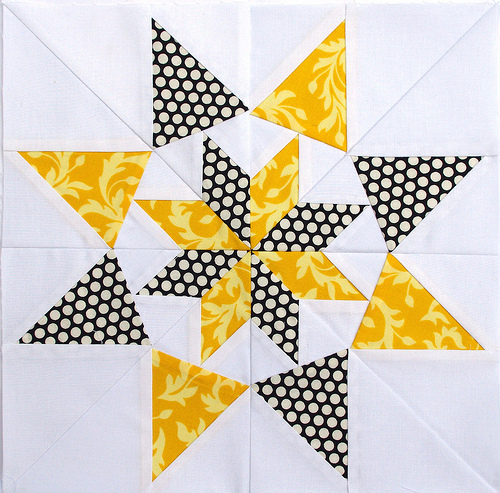 This block is called the Colorado Star and it is from the book titled 50 Fabulous Paper-Pieced Stars by Carol Doak. It's a book I have had in my quilt book library for quite some time and have photocopied foundation papers for numerous blocks, but until now have not sat down to piece any star blocks. The book includes a detailed step by step tutorial with photographs, as well as a presentation by Carol Doak demonstrating her paper-piecing technique on CD-ROM. Cheap A4 paper is perfect for this task. I used 70 gsm paper weight. Cut fabric patches larger than necessary to assist with easy placement. Use a 90/14 Needle and shorten stitch length to 18 to 20 stitches per inch. Use a dry iron to press. Don't remove foundation paper prior to sewing units into a block. 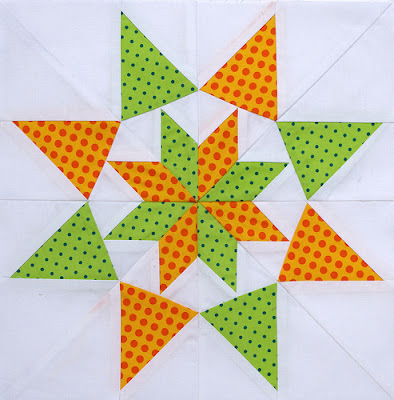 There are several great foundation paper piecing tutorials including Quilter's Cache - Practice Paper Piecing (great for beginners). Also the current Fat Quarterly (Issue 8 - Paper) has a detailed how-to, taking you step by step through the process of foundation paper piecing. Fat Quarterly Magazine is available from Fat Quarter Shop as an instant download. Paper piecing is a little fiddly, time consuming, and so very messy, but well worth this end result. Crisp lines and matching seams make for happy stitching! those look fabulous to me! I love paper piecing, too! So easy to get accurate, small pieces sewn together neatly. And I like Carol Doak's method/papers too. These blocks look just beautiful. Your stars look great. Thanks for the tips as I'm about to embark on a paper piecing journey through Fat Quarterly Issue 8, I've started a paper piece along and I am a paper piecing virgin! Where did you get your 70gsm paper from? I tried Officeworks yesterday and they only had 80gsm or higher and ended up buying tracing paper 60-65gsm and I'm not sure if that's going to work OK, just want to have a back up plan. Dolores, from memory the paper came from Kmart. It was cheap and we weren't too happy with the quality for printing documents etc; it was put aside for better quality paper. I knew I bought it for a reason :) it's perfect for paper piecing. Those are beautiful. 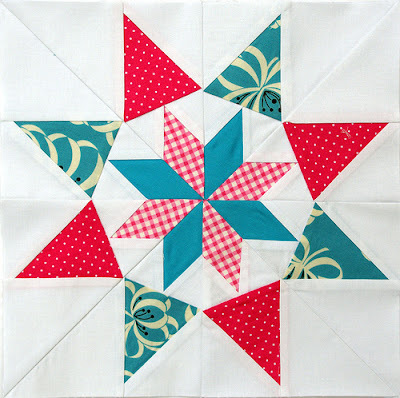 I'm enjoying doing some English paper piecing with some rose star blocks these days, and it's so much fun! I have that book too! I love looking through it, but I haven't sat down and made any of them yet....in time. I've just started getting acquainted with paper piecing and I love it. I've got the star book on hold at my local library - can't wait to try out this star. Thanks for sharing your versions of it. They are lovely. I'm working on the Vermont block right now! I love that book. Your blocks are absolutely beautiful Rita. This is going to be a wonderful quilt. Wow Rita -- your fabric combinations are gorgeous! THose are great! I wish I knew how to do that. The colors you chose are gorg too! Your blocks just keep getting more amazing! 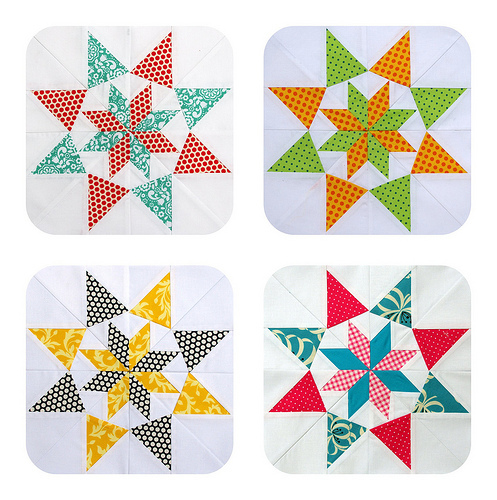 great star blocks! I'm yet to try paper piecing. You are so good with color, too! These are just beautiful! I've loved seeing you post pictures of them on Instagram :) I love paper piecing and have never understood why people don't like it. Everything's so precise and points meet! I love those Colorado Stars. I also own Carol Doak's book. Her tutorials are great. Those star blocks are beautiful Rita, I do love a paper pieced star. OK, who am I kidding, I love paper pieced anything pretty much. And thank you for the lovely FQ mention in there. I do love the crisp points that come from PP. I pre-sew all the sewing lines through the machine but without thread when I PP, makes paper easier to remove and pre-creases the lines. The stars are beautiful, they look like they are turning! Beautiful colour choices, really make these stars shine. I have tried foundation piecing a few times and always thought it took way too much time, but I am definitely going to think about another try. The modern fabrics against the white just make me look at stars in a completely new light, love that Colorado star. That teensy bit of Gingham is melting ma Heart! Rita they are fantastic! I need a star for a birthday block and I think this would be perfect :-) and I have that book too. Thanks for the great idea. Those are beautiful stars! I agree that paper piecing is well worth the effort. Thanks for the tips. I hadn't heard that one about not removing the paper until after it was in the block. Does that help to prevent distortion? Beautiful blocks, love all those colors. I have only done one small block of paper piecing and really like the result. Why shouldn't you remove the paper till after you sew the blocks together? Beautiful blocks!!!!!!!! Carol Doak is a genius! I am adding this book to my library!!!!! Great advice and heavely stars! Beautiful blocks. I think I might try this. Beautiful blocks. Makes me want to find this book. so so so beautiful! I could stare at these for hours! I love the accuracy of paper piecing but struggle with putting sections of the block together. Seems like the seams are never in the right direction to allow nesting of them. Is there a trick to getting them to lie (lay?) correctly? Or do you take the paper off, press them the right way and then put the sections together? I have looked all over and can't find an answer to this so maybe it's something I'm not doing correctly to get the seams to lie (lay?) right? Really great fabric choices. Like Jennifer Ellison, I swear by the add-a-quarter ruler. I recently got that same Carol Doak book. Glad to know I'm not the only one who ends up cutting pieces back to front or cutting to size only to find the seam allowance has been trimmed off in the process. Beautiful work, and I love your color combos as well. These will look so nice in a quilt. Bravo! I enjoy an occasional paper piecing, but hate those blocks where you sew the piece on "backwards" and angled--it's always FAIL on those for me (start again). Lovely stars. Fun to see. Adorei suas cores,lindas combinações.Faço pp tantos anos que não vejo mais dificuldade.O negócio é praticar.Beijos e obrigada . Your blocks look fabulous. I'm a sucker for stars but I find paper pieceing quite intimidating. I have the current Fat Quarterly to help ease me into it when I find the time to sit down and properly give it a go. I love your Colorado stars, I have had my first go at a paper foundation and I agree it does take some getting use to. Looks great still. Wow! I love all those dots! Your stars are fabulous! OMGoodness these are so beautiful I ordered the book right away!! Lovely blocks! I've had that book for a few months now, but haven't made anything from it yet. Love your stars! They look fabulous! I'm a little confused, maybe it's the difference between Aussie and American quilting... I was taught that "paper" piecing is sewing patches to a paper background, then removing the paper when the top was complete. "Foundation" piecing is sewing patches to a fabric background, which is then left permanently in the quilt. From the details in your post, I'm assuming you're doing what we call "paper piecing"...?